Jefferson Davis, the President of the Confederate States of America during the US Civil War, was born on the 3rd of June 1808 at what is now the village of Fairview, in that part of Christian county, Kentucky, which was later organized as Todd county. His father, Samuel Davis (1756-1824), who served in the War of Independence, was of Welsh, and his mother, Jane Cook, of Scotch-Irish descent; during his infancy the family moved to Wilkinson county, Mississippi. 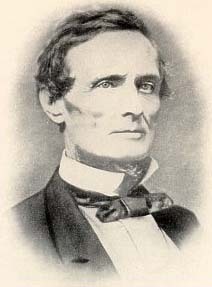 Jefferson Davis was educated at Transylvania University (Lexington, Kentucky) and at the United States Military Academy at West Point. From the latter he graduated in July 1828, and became by brevet a second lieutenant of infantry. He was assigned for duty to Jefferson Barracks at St. Louis, and on reaching this post was ordered to Fort Crawford, near Prairie du Chien, Wisconsin. In 1833 he took part in the closing scenes of the Black Hawk War, was present at the capture of Black Hawk, and was sent to Dixon, Illinois, to muster into service some volunteers from that state. Their captain was Abraham Lincoln, and Lieutenant Davis is said to have administered to him his first oath of allegiance. In June 1835 he resigned from the army, married Miss Sarah Knox Taylor, daughter of Colonel (later General) Zachary Taylor, and became a cotton planter in Warren county, Mississippi. In September of the same year, while visiting in Louisiana to escape the fever, his wife died of it and Davis himself was dangerously ill. For the next few months he travelled to regain his health; and in the spring of 1836 returned to his cotton plantation, where for several years he devoted his time largely to reading political philosophy, political economy, public law and the English classics, and by careful management of his estate he acquired considerable wealth. In 1843 Davis entered the field of politics as a Democrat, and exhibited great power as a public speaker. In 1844 he was chosen as a presidential elector on the James Knox Polk and Dallas ticket; in February 1845 he married Miss Varina Howell (1826-1906) of Mississippi (a granddaughter of Governor Richard Howell of New Jersey), and in the same year became a Democratic representative in Congress. From the beginning of his political career he advocated a strict construction of the Federal constitution. He was an ardent admirer of John C. Calhoun, and eventually became his successor as the leader of the South. In his rare speeches in the House of Representatives he clearly defined his position in regard to states rights, which he consistently held ever afterwards. During his first session, war with Mexico was declared, and he resigned his seat in June 1846 to take command of the first regiment raised in his state -- the Mississippi Rifles. He served in the Northern Campaign under his father-in-law, General Taylor, and was greatly distinguished for gallantry and soldierly conduct at Monterey and particularly at Buena Vista, where he was severely wounded early in the engagement, but continued in command of his regiment until victory crowned the American arms. While still in the field he was appointed (May 1847) by President Polk to be brigadier-general of volunteers; but this appointment Davis declined, on the ground, as he afterwards said, "that volunteers are militia and the Constitution reserves to the state the appointment of all militia officers." Afterwards, Davis himself, as president of the Confederate States, was to appoint many volunteer officers. Upon his return to his home late in 1847 he was appointed to fill a vacancy in the United States Senate, and in 1850 he was elected for a full term of six years. He resigned in 1851, but was again elected in 1857, and continued as a member from that year until the secession of his State in 1861. As a Senator he stood in the front rank in a body distinguished for ability; his purity of character and courteous manner, together with his intellectual gifts, won him the esteem of all parties; and he became more and more the leader of the Southern Democrats. He was, however, possessed of a logical rather than an intuitive mind. In his famous speech in the Senate on the 12th of July 1848, on the question of establishing a government for Oregon Territory, he held that a slave should be treated by the Federal government on the same basis as any other property, and therefore that it was the duty of Congress to protect the owner's right to his slave in whatever state or territory of the Union that slave might be. In the debates on the Compromise Measures of 1850 he took an active part, strongly opposing these measures, while Henry Stuart Foote (1800-80), the other Mississippi Senator, was one of their leading advocates. But although still holding to the theory expounded in his July speech of 1848, he was now ready with the proposal that slavery might be prohibited north of latitude 36 degrees 30 minutes north, provided it should not be interfered with in any territory south of that line. He resigned from the Senate in 1851 to become a candidate of the Democratic States-Rights party for the governorship of his state against Foote, the candidate of the Union Democrats. In the campaign he held, in opposition to the wishes of the more radical members of his party, that although secession might be resorted to as a last alternative the circumstances were not yet such as to justify it. A temporary loss of eyesight interfered with his canvass, and he was defeated by a small majority (1009), the campaign having been watched with the greatest interest throughout the country. In 1853 he accepted the position of Secretary of War in the cabinet of President Franklin Pierce, and for four years performed the duties of the office with great distinction and with lasting benefit to the nation. He organized the engineer companies which explored and reported on the several proposed routes for a railway connecting the Mississippi valley with the Pacific Ocean; he effected the enlargement of the army, and made material changes in its equipment of arms and ammunition, utilizing the latest improvements; he made his appointments of subordinates on their merits, regardless of party considerations; he revised the system of tactics, perfected the signal corps service, and enlarged the coast and frontier defenses of the country. During all this time he was on terms of intimate friendship with the President, over whom he undoubtedly exerted a powerful, but probably not, as is often said, a dominating influence; for instance he is generally supposed to have won the President's support for the Kansas-Nebraska Bill of 1854. After the passage of this bill, Davis, who as Secretary of War had control of the United States troops in Kansas, sympathized strongly with the pro-slavery party there. At the end of his service in the cabinet, he was returned to the Senate. To his insistence in 1860 that the Democratic party should support his claim to the protection of slavery in the territories by the Federal government, the disruption of that party was in large measure due. At the same time he practically told the Senate that the South would secede in the event of the election of a radical Republican to the presidency; and on the 10th of January 1861, not long after the election of Lincoln, he argued before that body the constitutional right of secession and declared that the treatment of the South had become such that it could no longer remain in the Union without being degraded. When his state had passed the ordinance of secession he resigned his seat, and his speech on the 21st of January was a clear and able statement of the position taken by his state, and a most pathetic farewell to his associates. On the 25th of January 1861 Davis was commissioned major-general of the forces Mississippi was raising in view of the threatened conflict. On the 9th of February he received the unanimous vote of the Provisional Congress of the seceded states as President of the "Confederate States of America." He was inaugurated on the 18th of February, was subsequently, after the adoption of the permanent constitution, regularly elected by popular vote, for a term of six years, and on the 22nd of February 1862 was again inaugurated. He had not sought the office, preferring service in the field. His brilliant career, both as a civilian and as a soldier, drew all eyes to him as best fitted to guide the fortunes of the new Confederacy, and with a deep sense of the responsibility he obeyed the call. He heartily approved of the peace conference, which attempted to draw up a plan of reconciliation between the two sections, but whose failure made war inevitable. Montgomery, in Alabama, was the first Confederate capital, but after Virginia joined her sister states, the seat of government was removed to Richmond, on the 29th of May 1861. How Davis -- of whom W. E. Gladstone, in the early days of English sympathy with the South, said that he had "made a nation" -- bore himself in his most responsible position during the gigantic conflict which ensued, cannot here be related in detail. In the shortest time he organized and put into the field one of the finest bodies of soldiers of which history has record. Factories sprang up in the South in a few months, supplying the army with arms and munitions of war, and the energy of the President was everywhere apparent. That he committed serious errors, his warmest admirers will hardly deny. Unfortunately his firmness developed into obstinacy, and exhibited itself in continued confidence in officers who had proved to be failures, and in dislike of some of his ablest generals. He committed the great mistake, too, of directing the movements of distant armies from the seat of government, though those armies were under able generals. This naturally caused great dissatisfaction, and more than once resulted in irreparable disaster. Moreover, he was not, like Lincoln, a great manager of men; he often acted without tact; he was charged with being domineering and autocratic, and at various times he was seriously hampered by the meddling of the Confederate Congress and the opposition of such men as the Vice President, A. H. Stephens, Governor Joseph E. Brown of Georgia, and Governor Zebulon Vance of North Carolina. During the winter of 1864-5 the resources of the government showed such exhaustion that it was apparent that the end would come with the opening of the spring campaign. This was clearly stated in the reports of the heads of departments and of General Robert E. Lee. President Davis, however, acted as if he was assured of ultimate success. He sent Duncan F. Kenner as special commissioner to the courts of England and France to obtain recognition of the Confederacy on condition of the abolition of slavery. When a conference was held in Hampton Roads on the 3rd of February 1865 between President Lincoln and Secretary William Henry Seward on the one side, and A. H. Stephens, R. M. T. Hunter, and Judge James A. Campbell, representing President Davis, on the other, he instructed his representatives to insist on the recognition of the Confederacy as a condition to any arrangement for the termination of the war. This defeated the object of the conference, and deprived the South of terms which would have been more beneficial than those imposed by the conqueror when the end came a few weeks later. The last days of the Confederate Congress were spent in recriminations between that body and President Davis, and the popularity with which he commenced his administration had almost entirely vanished. In January 1865 the Congress proposed to supersede the President and make General Lee dictator, -- a suggestion, however, to which the Confederate commander refused to listen. After the surrender of the armies of Lee and Joseph Eggleston Johnston in April 1865, President Davis attempted to make his way, through Georgia, across the Mississippi, in the vain hope of continuing the war with the forces of Generals Smith and Magruder. He was taken prisoner on the 10th of May by Federal troops near Irwinville, Irwin county, Georgia, and was brought back to Old Point, Virginia, in order to be confined in prison at Fortress Monroe. In prison he was chained and treated with great severity. He was indicted for treason by a Virginia grand jury, persistent efforts were made to connect him with the assassination of President Lincoln, he was unjustly charged with having deliberately and willfully caused the sufferings and deaths of Union prisoners at Andersonville Prison and for two years he was denied trial or bail. Such treatment aroused the sympathy of the Southern people, who regarded him as a martyr to their cause, and in a great measure restored him to that place in their esteem which by the close of the war he had lost. It also aroused a general feeling in the North, and when finally he was admitted to bail (in May 1867), Horace Greeley, Gerrit Smith, and others in that section who had been his political opponents, became his sureties. Charles O'Conor, a leader of the New York bar, volunteered to act as his counsel. With him was associated Robert Ould of Richmond, a lawyer of great ability. They moved to quash the indictment on which he was brought to trial. Chief Justice Salmon P. Chase and Judge John C. Underwood constituted the United States circuit court sitting for Virginia before which the case was brought in December 1868; the court was divided, the Chief Justice voting to sustain the motion and Underwood to overrule it. The matter was thereupon certified to the Supreme Court of the United States, but as the general amnesty of the 25th of December 1868 included Davis, an order of nolle prosequi was entered in February 1869, and Davis and his bondsmen were thereupon released. He died on the 6th of December 1889, at New Orleans, leaving a widow and two daughters -- Margaret, who married J. A. Hayes in 1877, and Varina Anne (1864-98), better known as "Winnie" Davis, the "daughter of the Confederacy", who was the author of several books, including A Sketch of the Life of Robert Emmet (1888), a novel, The Veiled Doctor (1895), and A Romance of Summer Seas (1898). A monument to her, designed by George J. Zolnay, and erected by the Daughters of the Confederacy, was unveiled in Hollywood Cemetery, Richmond, VA, on the 9th of November 1899. Mrs. Davis, who exerted a marked influence over her husband, survived him many years, passed the last years of her life in New York City, and died there on the 16th of October 1906.